« Finkbuilt Fine Art Givaway! 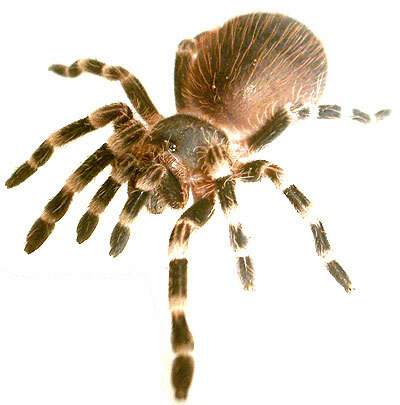 Tarantula spiderlings find the temperature in my Seattle basement just a tad on the chilly side. To keep them active and growing through the winter, I needed to add a heat source. Pet stores offer up some cheap little “resistance-wire” type heating pads intended for reptiles, but the ones that I saw lacked any type of control, and I read that they tend to be hot and unpredictable. I tried a medical type heating pad which had a rheostat, but it ran pretty hot even on the lowest setting. I remembered reading about people incubating bird’s eggs by placing a one gallon jar full of water with an aquarim heater in it, into a box containing the eggs. An aquarium heater makes a great tarantula warmer, since it has a thermostat that quite effectively regulates temperature right in the range that tropical animals like. I elaborated on the design slightly and came up with my spider warmer. 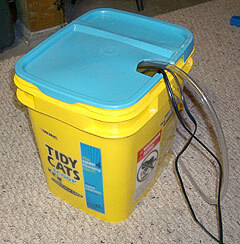 The heater and the pump go inside the plastic bucket, which is full of water. 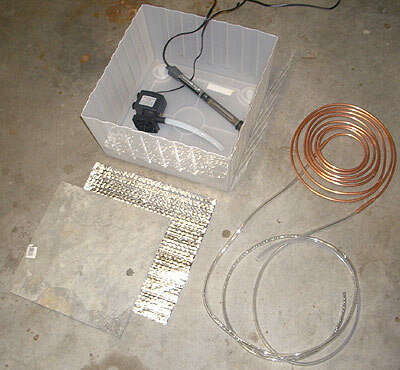 The pump circulates the heated water through the copper tube, which is coiled and sandwiched between a sheet of mylar insulation and a slate tile in the bottom of the plastic tub. 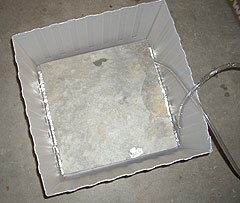 The tile keeps the heat nice and even and buffers it a bit. I then put all of the containers full of adorable little arachnids into the tub. So far, my spiders seem to be liking it. This heat transfer concept could be applied to terrariums or other tropical animal or plant habitats, but keep in mind that if the heat-exchanger is going to come into direct contact with the animals or their substrate, avoid using copper tubing, as copper is poisonous to most critters. This entry was posted on Monday, May 16th, 2005 at 10:34 pm	and is filed under Easy Projects, Miscellany. You can follow any responses to this entry through the RSS 2.0 feed. Both comments and pings are currently closed. love their box…, “Tidy Cats” ! Are thems spiders, or just a bunch of ‘tidy cats’??? I’m not convinced that you need the pump and tubing. In an aquarium, we circulate the water eliminate any hot spots within the water (and of course for other reasons). Here, you don’t care about the temperature differences across the pool of water, you only want to control the air temoperature in the space above the water. It seems to me that your aquarium heater in the water bath would do that by itself, although the tile is a good idea. Brenda — The animal habitat to be heated is remote from the water resevoir (bucket) , about 6 feet away. The clear tubing delivers the water to the cage site. 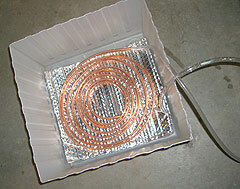 The copper coil beneath the tile is the remote heat exchanger. Steve, You should add some pictures of the spiders!